Cartoonist Lauren Weinstein will be at Quimby’s tonight, Thurs., Mar. 15, 7pm, in support of her most recent book, Girl Stories, which is one of the ALA's Great Graphic Novels for Teens of 2007. Lauren teaches drawing and cartooning to children and adults at the 92nd Street Y, Parsons School of Design, and the School of Visual Arts. In 2003, she was the recipient of the Xeric Grant, allowing her to self-publish her first book, Inside Vineyland. In 2004, she received the Ignatz Award for "Promising New Talent." 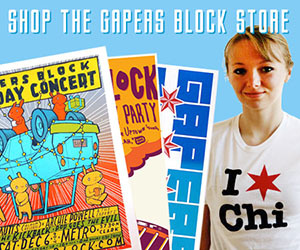 She has created comics and illustrations for PBS, The New York Times, Glamour, McSweeney's, LA Weekly, The Chicago Reader, Kramer's Ergot and Seattle's The Stranger. She is currently working on the sequel to Girl Stories — tentatively entitled Calamity — and a sci-fi fantasy comic entitled The Goddess of War. She is also the frontwoman in the band Flaming Fire. Check out her web site at girlstoriescomics.com. Q: I imagine the old adage "less is more" has its place within the art of cartooning. Where do you find this adage resonating most within the practice of your craft? Weinstein: Most of the comics from Girl Stories or Inside Vineyland are very short and simply told. At the same time, I don't try to make them too pointed or didactic. I like to leave lots of questions open for the reader. For instance: Why does the 13-year-old "Lauren" volunteer to submerge herself in a trash can? Why does she give her boyfriend a bag of dirt? Why does the drunk girl wander through the story and never show up again? The reader can draw their own conclusions. Q: All artists fall into a rut — writer's block, a stop in action. Using both text and image as a cartoonist, which one of the two do you reach out for when you stumble into such a rut? Is it text or is it image that rejuvenates your imagination? Weinstein: For me drawing is part of the writing of a comic and vice-versa. I try to do both of them together as much as possible whether or not I'm in a rut. I guess I turn to drawing a little more than writing because it's such a necessity to draw things accurately in a comic — when I mean accurate I mean accurate to the tone and feeling of the story. The best cure for a mental block for me is an immutable deadline. I feel I'm in a little rut right now because I'm creating a whole new graphic novel, a sequel to Girl Stories, and it's really hard to see my way through the entire story. So I've started keeping more detailed sketchbooks, which I think are just a way of wasting more time. Q: Coco Chanel once said, "Elegance is not the prerogative of those who have just escaped from adolescence, but of those who have already taken possession of their future." Where, if anywhere, do you find this idea of elegance emerging within your writing of Girl Stories? Weinstein: I would say a lot of Girl Stories is drawn in an ugly way, the people look bloated and weirdly hatched a lot of the time, and their eyes bulge out of their heads like exploding tomatoes. They are young and they are going through the worst period in their lives. They are mean to each other — that is ugly. But my book doesn't lack an adult perspective either, there are times when I poke a little fun at that over-dramatic teenager, like when "Lauren" smooshes her face against a bus window, looking out at a boy she just met on the bus, and says, "I've just blown my only chance to have love in my life!" I don't want to make Lauren's parents seem evil and I might have had I written this when I was a teenager. I also try to transcend the emotional chaos every once in a while with joy. Like in the comic, "John and I Go to the Movies," which is just a sequence of hand-holding and knee touching in the movie theater. Maybe all that can only be attained by having a little distance? John Hospodka is a life-long Chicagoan, and today lives with his wife in Bridgeport. He does not profess to be an expert in anything; he's just a big fan of the arts and is eager to make more sense of them. 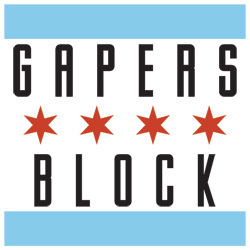 Direct comments or suggestions for interviews to tqf@gapersblock.com.